Zion Market Research has published a new report titled “Encapsulated Flavors and Fragrances Market by Technology (Physicochemical Process, Chemical, and Physical Process), By Encapsulation Process (Macroencapsulation, Hybrid Technology, Nanoencapsulation, and Microencapsulation), By End-User (Toiletries & Cleaners and Food & Beverages), and By Product Type (Aroma Chemicals, Essential Oils & Natural Extracts, Flavor Blends, and Fragrance Blends): Global Industry Perspective, Comprehensive Analysis and Forecast, 2017 – 2024”. According to the report, the global encapsulated flavors and fragrances market was valued at around USD 5,895.85 million in 2017 and is expected to reach approximately USD 8,122.74 million by 2024, growing at a CAGR of around 4.63% between 2018 and 2024. A technique to entrap flavors and fragrances within a coating material is known as encapsulation. Encapsulation protects the coated material from the outside environment. This prevents the loss of flavor and fragrances and limits the degradation during processes and storage. Additionally, encapsulation offers functional properties, such as a controlled release of aromatic molecules in a particular environment including water, mouth, or spray in the products such as flavored tea, candy, toothpaste, etc. Flavors and fragrances are sensitive and expensive products. These are utilized as excipients in the industries such as food and beverages, cosmetics and personal care, etc. The encapsulation process is used to protect flavors and fragrances for long-term use. Microencapsulation is another process to encapsulate the flavors and fragrances on a micrometric scale. It is a process wherein droplets or tiny particles are coated in order to make small capsules. Microencapsulation or encapsulation of flavors and fragrances is used to provide uniform and improved fragrance, taste, colorings, increased shelf life, and protection from harsh conditions. Encapsulation acts as a barrier between flavor and environment in order to accomplish functions such as to separate incompatible flavor constituents, controlled or triggered release, and protecting flavor from evaporation, moisture uptake, oxidation, etc. Fragrance encapsulation has wide application for the manufacturing of perfumed suits for customers in the textile industry. Poor properties of the flavors and fragrances are anticipated to create major restraint in the food and personal care industry. This has created potential opportunities for the microencapsulation or encapsulation of the products through different technologies such as physicochemical, chemical, and physical processes. High demand for flavors in the food products and fragrances in the toiletries is projected to enhance the demand for the encapsulated flavors and fragrances across the globe. Moreover, rising demand for healthy, wholesome, and natural products has anticipated increasing the global encapsulated flavors and fragrances market over the forecast period. High investments in the research and development activities by the leading players across the globe especially from the developed region are estimated to bolster the growth of the global encapsulated flavors and fragrances market in the near future. Increasing demand for functional food across the globe is also another factor fueling the growth of the market over the forecast period. However, several factors are hindering the global encapsulated flavors and fragrances market including government restrictions on consumer safety, volatility in prices of raw material, etc. Additionally, the high cost of encapsulation technologies leading to an increased final cost of the product is also another factor affecting the global encapsulated flavors and fragrances market. On the basis of technology, the global encapsulated flavors and fragrances market is classified as physicochemical, chemical, and physical processes. Among the aforementioned segments, the physical process accounts for a dominant share in the market over the forecast period. The physical process is sub-segmented into fluid bed technique, extrusion, and atomization. Atomization is again segmented as spray disk, spray chilling, and spray drying. By encapsulation process, the market is segmented into macroencapsulation, hybrid technology, nanoencapsulation, and microencapsulation. Among which microencapsulation is estimated to comprise significant share in the global encapsulated flavors and fragrances market. The global encapsulated flavors and fragrances market is segmented as toiletries & cleaners and food & beverages by end-user. Wherein, the food & beverages segment is projected to grow at a substantial growth rate over the forecast period. Food & beverages are sub-segmented into bake mixes, chewing gum, pressed tablets, and mixes. Based on product type, the global encapsulated flavors and fragrances market is classified as aroma chemicals, essential oils & natural extracts, flavor blends, and fragrance blends. Among which flavor blends segment is estimated to account for a significant share over the forecast period. 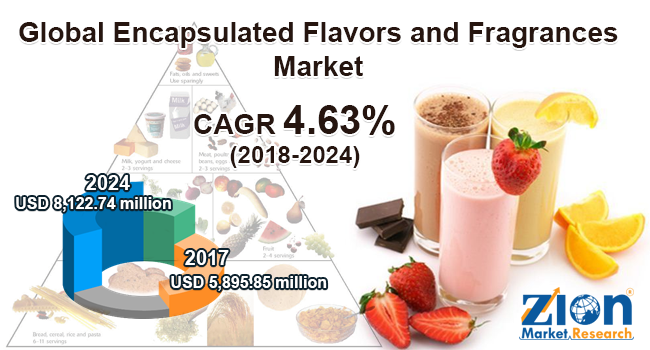 The report includes detailed profiles of key players in the encapsulated flavors and fragrances market across the globe such as Ingredion Incorporated, Cargill Incorporated, Tate & Lyle PLC, FrieslandCampina Kievit, Symrise AG, and Firmenich Incorporated. Some of the other manufacturers of the global encapsulated flavors and fragrances market are Lycored Group, Sonarome, Sensient Technologies Corporation, Synthite Industries Ltd., Nexira SAS, Mane, and Aveka Inc. The detailed description of the companies operating in the global encapsulated flavors and fragrances market includes parameters such as financial overview, business strategy, key developments, and company overview of the company.